We really enjoyed our trip to Sicily, and we are already planning to come back. Outstanding views, baroque towns, picturesque beaches, delicious food and sympathetic Sicilians made our trip unforgettable. It may be slightly less impressive than Amalfi Coast (you can check our post and compare), but for sure is much more authentic… and cheaper. You normally need to choose between West or East Sicily if you do not have enough time. Palermo is the main city of the former, and Catania of the latter. If you are planning to fly you will get to one of these two cities. In our case, we spent 4 days on the east side of the island. 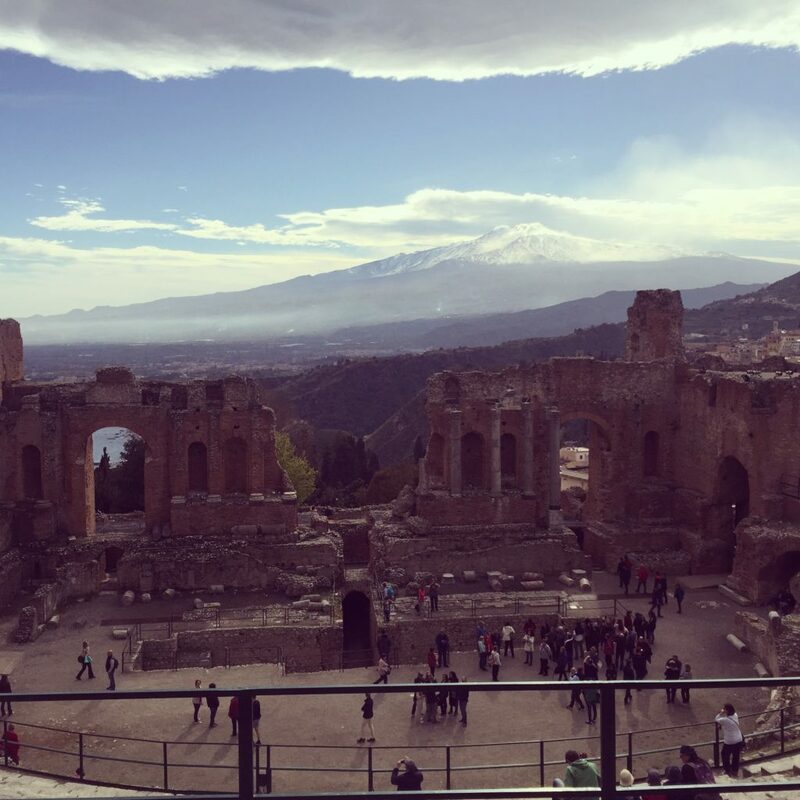 Taormina is probably Sicily’s most popular destination. This is why it has gained a reputation of touristy and expensive. Prices can indeed get high especially during summer (July and August mostly), and accommodation can sell out as well. However; the city merits at least a couple of days. It was built high above the sea and offers stunning views of the sea and the great and World famous Mount Etna, the still active volcano that erupted twice in 2017. Teatro Greco (first picture above) is its main attraction, with breathtaking vistas of mountains, towns and sea. The Old Town is 250 metres above the sea, and even higher up (150 metres) is a Saracen castle. Isola Bella is another popular point of interest, facing the largest public beach, Mazzaro. As you can see in the picture above, you can even cross to the tiny island, although this could depend on the tide. Other attractions include Santuario Madonna della Rocca, Palazzo Duca di Santo Stefano, Porta Messica and Park Giovanni Colonna. In terms of accommodation, we stayed at Hotel Del Corso. It is a modest hotel but very well located, metres away from a huge parking and just at the beginning of the main street in the Old Town. I must also recommend Pizzeria Villa Zuccaro, where we had an incredible pizza with burrata. One of the best pizzas I ever had. 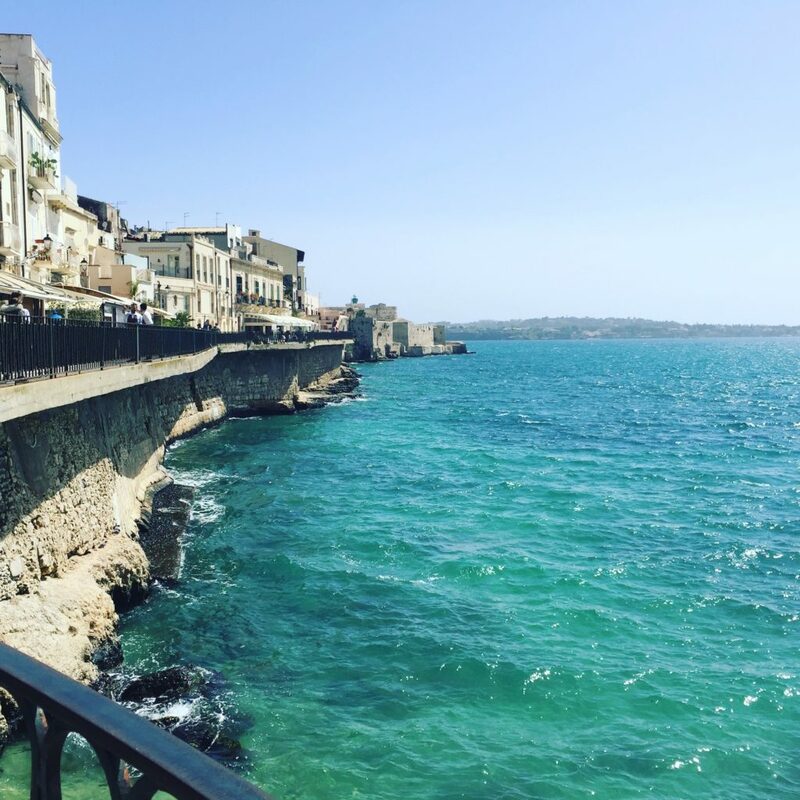 Syracuse is another very popular destination in Sicily. 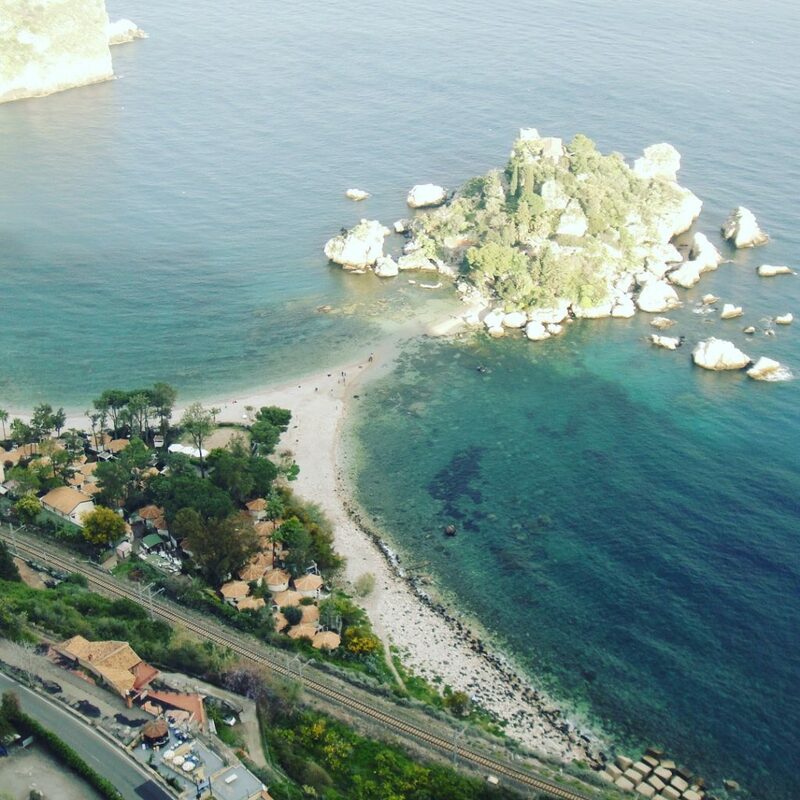 It is located in the South part of the Island (1 hour and 30 minutes from Taormina by car), and very close to the rest of the places in this post, so a sensible route would be to visit Taormina first and then head south, or vice-versa. The heart and most vibrant part of Syracuse is Ortigia island, where you can also visit the popular Mercato di Ortigia. The market has a strong Italian personality: a lot of shouting, gesticulating and great food. The most popular shop is called Caseificio Borderi, where you can get delicious sandwiches filled with cured meats, cheeses and fresh salads. The place is always busy and you may need to queue for an hour, but for most people is a unique experience. Normally the sandwich-master asks “Do you trust me?”, to then prepare an incredible sandwich. Most of the online reviews consider their paninis a “piece of art”. And of course, there is a lot more than the market. I would recommend walking all the way to Fonte Aretusa, to then walk by the coast until to reach the end of the path. From there you can keep walking around the medieval lanes and enjoy its baroque piazzas and golden walls. The city was considered one of the greatest cities of Ancient Greece. Other attractions in the island are Parco Archeologico della Neapolis, Tempio di Apollo, Fontana di Diana, Duomo di Siracusa and Castello Maniace. The little town of Noto was probably the best surprise of our trip to East Sicily. It was also the best choice as a place to stay most of the days, acting as a base to visit the rest of the island (east side). It is strategically convenient but also beautiful and calm. It really looks like a film set, and it is considered one of Sicily’s most beautiful historic centres. It is also classified as a World Heritage of Humanity site by Unesco. 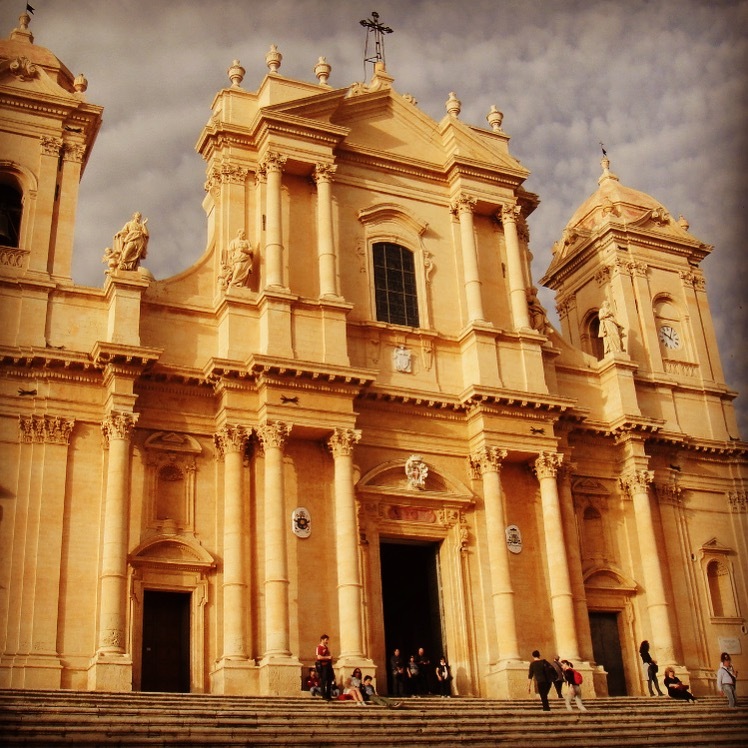 Noto’s attractions are mostly related to its baroque architecture, that flourished in Europe from the early 17th until the late 18th century. Cattedrale di San Nicolo, Palazzo Ducezio, Palazzo Castelluccio and Chiesa di San Domenico are some of them. We stayed in an amazing and authentic Italian Bed & Breakfast, so I strongly advise to stay at Notia Rooms. For more information about this town, please visit our post “Noto, a gorgeous baroque town in East Sicily“. Marzamemi is one of the prettiest fishing villages in Italy. It is only 3 km from Pachino and 20 km from Noto. Unlike many other towns in Sicily, it doesn’t have Greek roots; rather it was founded by the Arabs. The main attractions of this town are the amazing sight of the sea, its main piazza with picturesque restaurants, the medieval narrow alleys and buildings, and “The Tonnara“. 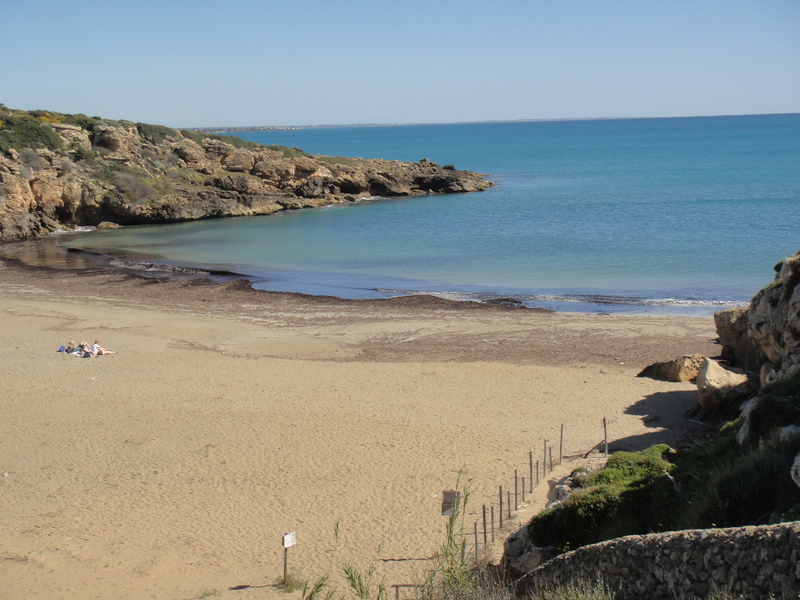 There are also a couple of beaches nearby, such as Spinazza and Marinella, or just a few km away such as Porto Palo di Capo Passero or San Lorenzo (see section below). Bear in mind that some of them may have some seaweed. “The Tonnara” was a palace built by the Arabs. It became a tuna processing plant. Although it is no longer in function, you can still find all kind of local delicacies, including canned tuna, dried tuna roe (bottarga), smoked swordfish, marinated anchovies, seafood pasta condiments and tuna salamis. Its main square (Piazza Regina Margherita) is small but beautiful, and host a few excellent restaurants such as Taverna La Cialoma. If you want something simpler you can go around to the corner to Il Mascherone, where can enjoy a beer and fried fish sittings outside. Another quality restaurant is Campisi, which is 10 minutes from the main square. Bear in mind that these places can get busy on weekends, so better to book a table in advance. On the south side, you can find the little fishing harbour, with colourful wooden boats and water that takes on colours ranging from turquoise to green and blue. This is pictured in the video above. San Lorenzo was our favourite beach of the trip. It is only 23 minutes away from Noto, and it totally deserves a visit. 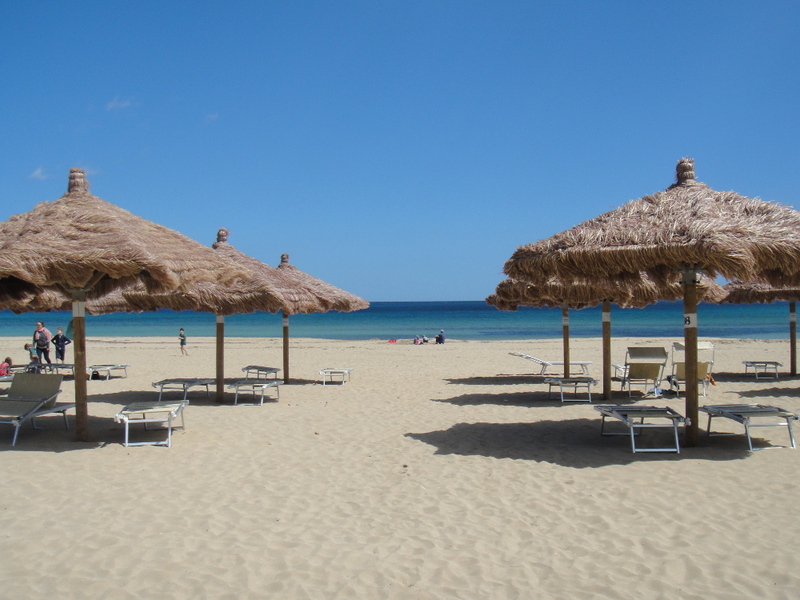 It offers a large sandy beach with good facilities such as parking, restaurant, bar, sun-beds and umbrellas. The water is light blue and the sand is thin and white. If you are lucky with the weather and you manage to avoid the peak touristic months (July/August), San Lorenzo is a great spot to enjoy a walk and some time on the beach. We recommend it even if you are not planning to swim or spend a full day in the sun. We were there for Easter, so it was not high season and the area was calm and relaxing. Calamosche is another very popular beach in Sicily. It is part of a natural reserve, so you need to drive to a parking space, leave the car there and walk for around 20 minutes until you get to the beach. The parking area has toilets and a restaurant, but there are no facilities on the beach itself. As it is inside a protected area, Calamosche feels quite natural and untouched, especially if you do not go during high season. The picture above was taken during Easter and shows that it is far from being crowded. However; during the summer the beach can get packed, but also slightly better as some work is done on the sand and the surroundings to receive visitors. I would recommend bringing water and some food if you are planning to spend some time. Another good news is that there is no parking nor entrance fee. Ragusa comprises two towns/areas which are quite different. On one side is Ragusa Superiore, which is busier and more modern. On the other side is Ragusa Ibla, with a strong historical and cultural background. Ragusa Ibla is another well-known hilltop baroque town in Sicily. Tangled alleyways, grey stone houses and baroque palazzi are part of its historic centre. The town is high from the sea level and the road to get there present beautiful views as well. Some of its main attractions are Duomo di San Giorgio (cathedral), Museo del Duomo, Giardino Ibleo park. 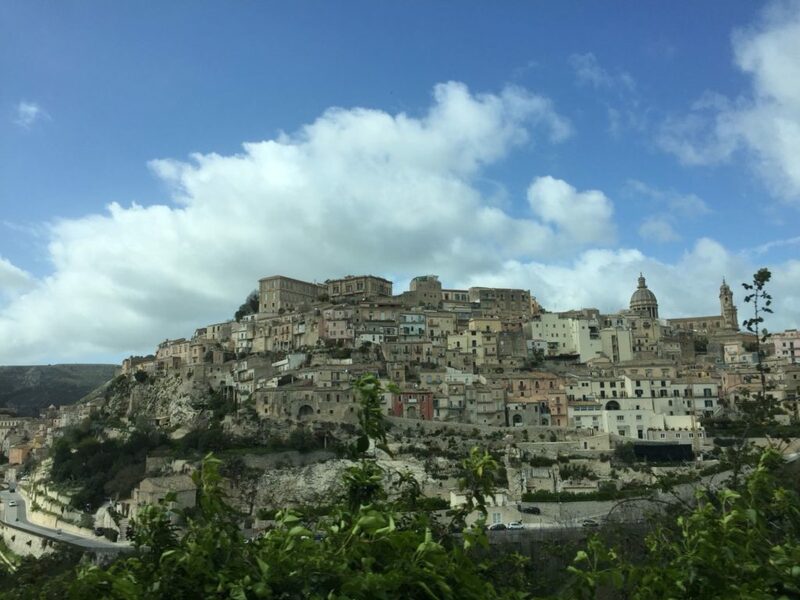 You may also want to visit Ragusa Superiore (the two towns meet at a saddle of land marked by the small Piazza della Repubblica). Ragusa was not our favourite town, and that the reason to leave to the end. I think it worth visiting, but if you need to leave of the towns out, I would go for this one.